Valley Mushrooms takes care to grow, harvest, package, and ship our mushrooms so that they are fresh and delicious when you buy them. Mushrooms must be handled delicately to minimize bruising and cleaned carefully to maximize taste. Here are some helpful tips on how to clean and prepare mushrooms at home. If you are just using the caps of the mushrooms, simply twist out the stems or remove them with the tip of a knife. 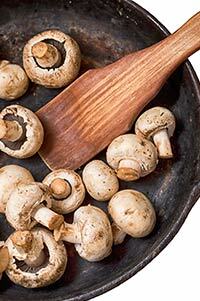 Use a damp paper towel or a soft mushroom brush to wipe each mushroom to remove any dirt. You can quickly rinse the mushrooms with cool water and pat dry with paper towels. To preserve the whiteness of sliced button mushrooms (for salads, vegetable trays, etc. ), dip them in a little lemon juice. Brush your pan with oil or butter and heat on high. Add a single layer of mushrooms. Once mushrooms are brown on one side, flip and repeat until other side turns the same colour. Remove from heat and season to taste. Lightly brush mushroom caps and stems with oil to keep them moist and season with salt and pepper. Grill or broil 4 to 6 inches (10 to 15 cm) from heat source for 4 to 6 minutes on each side. For something a little different, try brushing the mushrooms once or twice with your favourite dressing or sauce instead of oil. Short on time? Place 8 ounces (28 g) of thickly-sliced mushrooms in a microwaveable bowl. Cover and cook on high for 2 to 3 minutes, stirring once. Preheat oven to 232°C (450°F). Brush mushrooms with 1 tablespoon (15 ml) of oil for each 8 ounces (28 g) of mushrooms. Place mushrooms in a shallow baking pan and place in oven. Stir occasionally until brown. Roast for approximately 20 minutes. Shelf-life varies, but mushrooms are usually best when used within 5 days of purchase. To prolong shelf-life, store mushrooms in a porous bag where air can flow freely (i.e., brown paper bag), and place them in the refrigerator immediately. Never store mushrooms in an airtight container or plastic bag as this can cause moisture to gather, which can lead to accelerated spoilage of the mushrooms. Don't place heavy materials on top of the mushrooms while stored in the fridge. Drying mushrooms is the oldest and most commonly used way to preserve mushrooms. 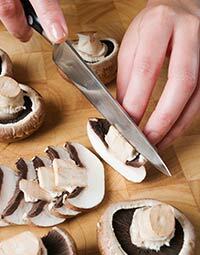 First, clean the mushrooms, then cut the mushrooms into thin slices to speed up the drying process. Place mushrooms on a non-oiled baking sheet in a single layer. Place the mushrooms in an oven preheated to 66°C (150°F) for 1 hour. Remove mushrooms from oven and flip them to the other side, blotting any moisture with a paper towel. Place mushrooms back in oven for 1 more hour, or until they are completely dry. Remove from oven and allow the mushrooms to cool. A properly dehydrated mushroom should snap apart like a cracker. 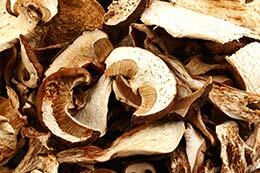 Store the dried mushrooms in an air-tight container, but only after they have cooled completely. Condensation from putting them away while they are still hot can ruin your efforts. Keep the mushrooms in a dark, cool location until ready to use. Mushrooms can be frozen for future use. To do this, clean, slice, and lay the mushrooms on a cookie sheet with enough space between them so they are not touching. Freeze, then simply transfer to a plastic freezer bag. Alternatively, you can sauté fresh mushrooms, let them cool slightly, and freeze them in an airtight container for up to 1 month. When preparing mushrooms from a frozen state, do not thaw them. Heat oil in a pan and cook mushrooms for 30 seconds. Remove mushrooms from heat and let them finish cooking on their own. Pickled mushrooms make a delicious side dish or salad. First, clean mushrooms and place in a cooking pot with enough water to cover the mushrooms. Add 118 ml (½ a cup) of lemon juice to the water, bring to boil, and cook for 15 minutes. When mushrooms are cooked, drain the liquid and set aside. Next, prepare the marinade. Place 473 ml (2 cups) of water, 15 ml (1 tablespoon) of salt, 15 ml (1 tablespoon) of sugar, 6 bay leaves, and 8 whole peppercorns in a separate pot and bring to a boil. Once salt and sugar has dissolved, add 6 tablespoons of vinegar. Remove from heat and set aside. Dice 6 garlic cloves and place on the bottom of jars. 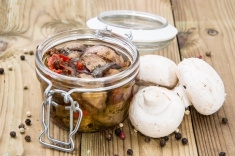 Fill jars with cooked mushrooms, then pour marinade over top. Cover and store in refrigerator for up to a few weeks. For more information on how to prepare mushrooms, check out our recipes. Mushrooms have no chlorophyll (a green pigment in plants), so they don't need sunshine to grow and thrive.